iCare tonometers are based on unique, patented rebound technology, in which a very light and small probe is used to make momentary contact with the cornea. The quick and painless measurement is barely noticed by the patient and any anesthesia or inconvenient air puffs are not needed at all. Icare technology has been proven accurate and reliable by several clinical studies. iCare Tonometers provide easy and intra-ocular pressure measurement. An initial visual field screening can be carried out by the optometrist by asking you to keep your gaze fixed on a central object, covering one eye and having you describe what you see at the periphery of your field of view. 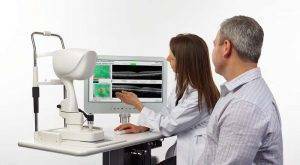 These machines can create a computerized map out your visual field to identify if and where you have any deficiencies.